Last year, Cyrus Duran was working as an assistant manager at a vegan restaurant in North Berkeley, feeling aimless. Raised by his mothers in Albany, California, Duran had been living on his own since he was 16. He'd dabbled in community college and worked a few jobs at chain stores, but was struggling to find real goals. A friend recommended he look into a training program called Year Up. Now, Duran has a permanent job in business sales at LinkedIn (LNKD). It's the kind of unlikely, fast-track matchmaking that Year Up specializes in. 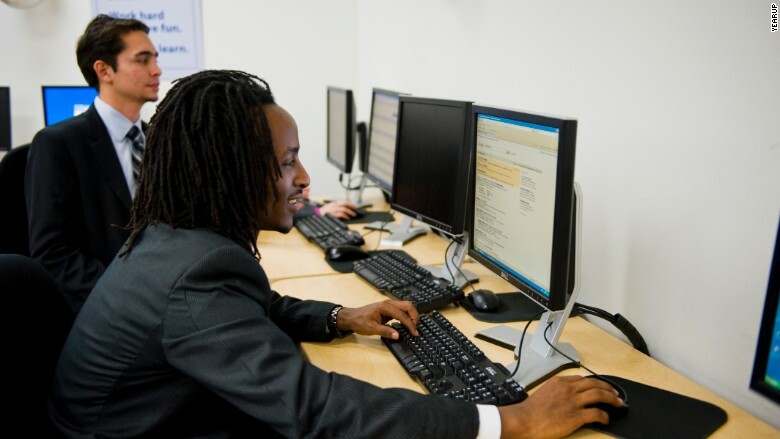 Year Up offers lower-income young adults six months of technical training for entry-level jobs, and then places them in six-month corporate internships. Started in 2000 in Boston, the program now has 14 sites and 523 employees. The nonprofit's Bay Area program is a bright spot in the sometimes tense relationship between tech companies and the community. Started in 2008, the program's offices in San Jose and San Francisco have trained more than 1,200 students. The influx of tech workers to the Bay Area has helped fuel a housing shortage and led to sharp increases in rents and evictions. Long-time residents are being displaced, and lower-income kids who've grown up here have witnessed the radical changes first hand. And when it comes to hiring, a 19-year-old restaurant worker in the East Bay with barely any college isn't on anyone's radar. During his six months as a student, Duran says he picked up basic business communication skills, learned how to use Excel and Outlook, and discovered a passion for public speaking. A self-described lone wolf, he was quickly absorbed into a tight, supportive network of students and educators at Year Up. The program is free and the students are given a stipend and can earn up to 24 college credits. Applications are mostly word of mouth, though Year Up does some community outreach. In the Bay Area, Year Up teaches basic computer skills and then separates students into specialties, such as IT help, project management and cybersecurity. Year Up also focuses on the kinds of soft skills that even Ivy League graduates sometimes lack. Students learn how to engage in small talk, make themselves heard, and understand the minefield of unwritten workplace rules. They're even required to dress in corporate attire for the full year, making them stand out in San Francisco's mostly hoodie-and-jeans crowds. The training prepares students for what is sometimes their first office job. "I experienced culture shock because I come from East Oakland, I come from a very low income community, and all the sudden I'm surrounded by a lot of privilege and wealth," said Lirio Zepeda, a Year Up graduate who had an internship at Workday, a finance and HR software company. The 25-year-old had dropped out of college when her mother got sick and was looking for a career. With Year Up's training and internship, Zepeda said she finally started to feel comfortable at work. She was just hired by Workday to be a full-time QA engineer. She's one of the 52% of Year Up's Bay Area graduates who turn an internship into a permanent position. "There's a war on talent in the tech industry. We are all fighting for the best and the brightest," said Carrie Varoquiers, vice president of global impact at Workday. "Looking beyond the traditional resume with the four-year computer science degree from a top university is critical for success." For Silicon Valley, Year Up offers a small but growing pipeline for local, diverse, undiscovered talent. Year Up has partnerships with more than 250 major companies, including Salesforce (CRM), Facebook (FB), Symantec (SYMC), PayPal (PYPL) and Twitter (TWTR). The companies regularly take on and mentor multiple interns. Corporate partners help fund Year Up in exchange for access to the trained interns. The program also receives money from private organizations and donors. Salesforce has been Year Up's largest local partner, contributing $2.6 million in grant money and hosting 173 interns. 99 of them were hired on as full-time employees. "We are living in a time of incredible innovation -- yet some of these interns that are from the Bay Area have never been to downtown San Francisco, or been in an office building," said Ebony Frelix, Salesforce's vice president of philanthropy and engagement. For people like Duran, Year Up was a lifeline during a tough period. "I don't think without Year Up I would have had the knowledge to do any of it. I would have just been swimming and lost," said Duran.